Why You Should Buy a Colgate 26 Sailboat? Read our Colgate 26 review below to find out why this sailboat is a great match for you. The perfect boat for family sailing, all the safety features and design qualities listed below are standard on the Colgate 26. This highly responsive mid-sized sailboat is extremely well balanced and can be sailed easily with just the jib or the mainsail alone. The Colgate 26 has a huge cockpit for a boat of this size, able to comfortably seat families with lots of kids who love to dangle their feet in the water while sitting on the low stern. The Colgate 26 cockpit is also spacious enough to accommodate as many as four couples out for a pleasure sail (as told to Steve Colgate by a Colgate 26 owner). Stability is a huge benefit in the Colgate 26 design features. The Colgate 26 is so stable and floats so high, even in a knockdown water does not get into the cabin. Also, there are no through-hull openings in the standard sail-away model. If you are sailing this boat with beginners, or using it in a sailing school environment, an extra mainsheet release on the traveler provides ultimate control – like dual steering in a driver’s ed course. Note the instructor holding the lazy end of the mainsheet in the photo. Of the many Colgate 26 sailboat design features that make this boat so special, Steve Colgate made sure the Colgate 26 is easy and quick to put away at end of the day, and at the end of season. The Colgate 26 is almost maintenance-free Because of its solid fiberglass hull construction, and a solid rubber bumper over the hull deck connection, bonded and secured with stainless bolts about every six inches. Reinforced fiberglass in the bow, mast support and keel attachment areas, all provide additional strength. The deck is sandwiched with core cell foam for extra rigidity. The rubrail deflects waves outboard, making the Colgate 26 a surprisingly dry boat to sail. 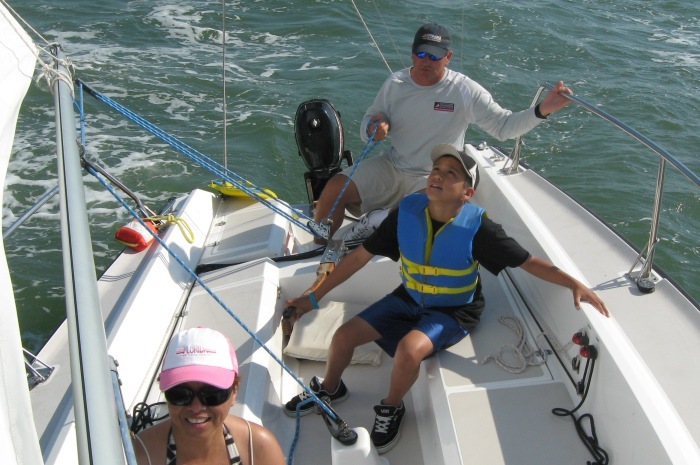 If you want to learn more about sailing, sign up for our 2 & 5 day Learn to Sail courses!